A Professional Networking Event @ Panchito’s at The Quarry, 7310 Jones Maltsberger (Next to StoneWerks) Thursday, September 3rd from 6:30 -9 p.m. $5 Donation to Benefit The Children of Positive Beginnings, Inc.
September 5th-63rd Birthday of Walker Report Publisher/Editor, Judge Steve Walker!!!!!!! September 9th-Shavano Park Mixer, Wednesday 09-09-09 from: 5:30 p.m. to 7:30 p.m @ Burger Bistro, 2267 NW Military Hwy(210) 366-9061. September 9th-The San Antonio Hispanic Chamber of Commerce (SAHCC) will celebrate Mayor Castro’s first 100 days as the mayor with a reception at 5:30 p.m. on Wednesday, Sept. 9th, at the IBC Bank located at 130 E. Travis. September 10th-A Birthday Fundraiser for Judge JoAnn DeHoyos Re-election bid, for County Court #11, Thursday, September 10th from 5:30-7:30 p.m. @ Landry on the River, 517 N. Presa. RSVP: Delilah, jdehoyos2010@att.net or 490-6160. September 10th-NHPO Professional Development Speak Series presents Public Service: A Voice In The Community presented by Rebeca Martinez @ the Palm, 233 E. Houston St., Thursday, September 10th from 11:45 a.m.-1 p.m.Admission: $25 NHPO Members & $30 Non-NHPO Member. September 11-Quinceanera Celebration & Awards Dinner, from 6-9 p.m., Friday, September 11th @ LaVillita Assembly Building, 418 Villita. 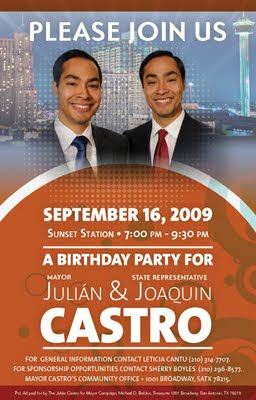 Arthur Amerson, former Councilman Juan Solis & Councilwoman Mary Alice Cisneros will be honored. September 11th-2009 San Antonio League of Women Voters Dinner & Roast of City Manager Sheryl Sculley, Friday, September 11th, with dinner @ 7:30 p.m. @ Oak Hills Country Club on Fredericksburg Road. September 12th-28th Annual 16 de Septiembre Parade & Festival, Grand Marshal, Mayor Julian Castro, Fundraiser, Host: Avenida Guadalupe AssociationSaturday, September 12th @ 11 .m. 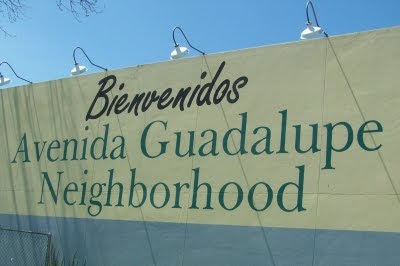 to 10 p.m. @ Avenida Neighborhood, Guadalupe at Brazos. September 12th-Come & meet Paul Talamentez, candidate for the 285th District Court, Saturday September 12th from 10-11:30 a.m. @Nava's Family Restaurant, 1573 Bandra Road. Call: 385-9075 for more info. September 12th-Fundraiser Alamo City Red Raiders Football Youth, @ Fatso's Sport Gardens, Saturday, September 12th at noon-4 p.m.
September 12th-The Neighborhood Resource Center Presents 20th Annual Neighborhood Conference, Saturday, September 12th • 8:00 a.m. – 3 p.m.
September 16th-Please join us September 16th @ Sunset Station from 7-9:30 p.m. A Birthday Party for Mayor Julian & State Rep. Joaquin Castro. September 17th-Exhibit Opening Reception for TUSKS! Ice Age Mammoths & Mastodons @ UTSA's Institute of Texan Cultures, Thursday, September 17th at 5:30 p.m.
September 18th-Life Synagogue will host a job & health fair, sponsored by SAJOBNET. Friday September 18th, from 10 a.m.-2 p.m. Claude Black Community Center, 2805 E. Commerce Street 210-240-7340, Any vendor who wants a table please email us at http://LSJOBFAIR@GMAIL.COM; for details. September 19th-3rd Annual Great Strides Thousand Oaks 5K Walk/Fun-Run, Saturday, September 19th, @ McAllister Park, Pavilion 4 - Thousand Oaks, Check-in: 8 a.m. Start time: 9 a.m. For more info call the CFF Lone Star Chapter: 210-829-7267 or e-mail hfarr@cff.org. September 20-Torchlight Technologies presents a networking mixer, September 20th from 6-8 p.m. Plaza Club, 100 W. Houston St., Ste 2100. (Frost Bank Tower) Hosted by Brandi Lopez. Saturday, September 12th @ 11 .m. to 10 p.m. @ Avenida Neighborhood, Guadalupe at Brazos. SATechNews.com 8th Birthday Bash and Hi-Tech Mixer! the Best Power Networking in San Antonio. When: September 10th from 5:30 - 8 p.m. Welcome Special Guest Speaker, Social Media Expert Jennifer Navarete. Local Muslims & non-Muslims celebrated a Ramadaan Iftar Dinner @ the omni Hotel, Friday, August 28th. Ramadaan Iftar Dinner drew Muslims & Christians alike @ the Omni Hotel near the Colonnade, Aguust 28th. Guest speakers included Mayor Julian Castro, Balcones Heights Mayor Suzanne DeLeon & Police Chief Bill McManus. Sister Martha Ann Kirk, Th.D. spoke of Muslim communities internationally and locally being active in charity work and education. She particularly noted members of the Muslim community in San Antonio who have contributed to education at the University of the Incarnate Word by speaking and participating in dialogues there.